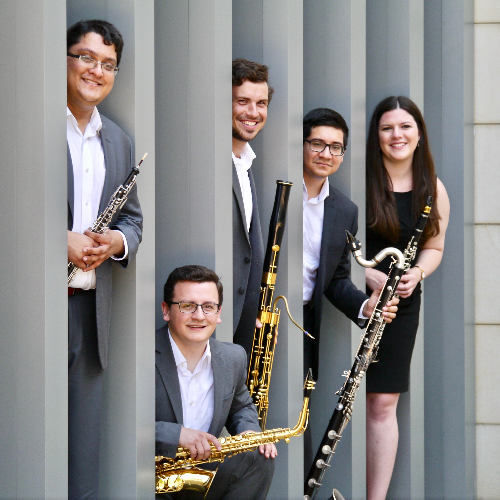 The Vanguard Reed Quintet (VRQ) is committed to breaking new musical ground, increasing the depth and diversity of the reed quintet’s core repertoire, and engaging audiences with innovative, adventurous, and inspiring musical experiences. Since 2016, VRQ has commissioned new compositions from seven young composers including Douglas Hertz, whose work From Lidless Eyes (Time Knows No Bounds) was recently featured at the 2017 Midwest Composers’ Symposium. The ensemble’s commitment to deep collaboration with fellow musicians and artists results in performances that elevate the reed quintet’s versatility, sensitivity, and power and “connect [the] audience with the intentions of the composer.” VRQ also performs reed quintet standards ranging from original works by Nico Muhly and David Biedenbender to arrangements of Mozart and Ravel.